Istanbul-based event engineering company Phantom has supplied a tip-top team of Clay Paky Alpha, A.Leda, and Sharpy fixtures to light the sparkling 2013 Mediterranean Games Opening and Closing Ceremonies. 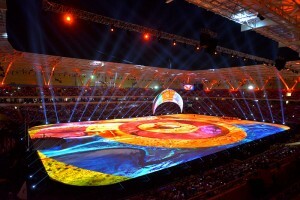 Eighteen months of preparation culminated in the Opening Ceremony of the 17th Mediterranean Games in Mersin, Turkey on Thursday June 20. 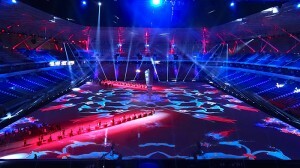 Lighting designer Jean-François Bonnement from Paris-based visual arts company Concept K, specified more than 400 Clay Paky fixtures to realise his dramatic design, included Alpha Profile 1500, Alpha Spot HPE 1500, Alpha Wash 1500, Alpha Profile 700, Alpha Spot HPE 700, Alpha Wash 700, Sharpys, A.leda Wash K10 and A.leda Wash K5. "We chose to use Clay Paky fixtures because they are the only ones that can provide a balanced range of high powered luminaires such as the Alpha 1500 range," comments LD, Jean-François Bonnement. "We needed to cover maximum space with the minimum number of luminaires. The Alpha Range responds well to this expectation. We used the wonderful Alpha Profiles for big zooms, image projection and shapes. As for the Sharpy, well, these are the only luminaires in their category that can deliver this kind of effect close to the audience and the stage. They are incredibly small and discrete, which allows us to rig them close to the audience." Bonnement applied the considerable power of 80 Clay Paky Alpha Spot HPE 1500s around the Field of Play to light the audience and create the stunning special effect for the show. 60 Alpha Wash 1500s were rigged between the Alpha Spot HPE 1500 to take care of audience, scenic movement and the cast of dancers and performers while 30 Alpha Profile 1500s – 20 of which were on the roof – were used to deliver striking special lighting effects. The other 10 were positioned on a central truss to focus on scenic elements. Bonnement also specified 110 Sharpys, which he rigged on the roof and in the truss to create strong architectural beam effects that interacted to the music. He also used 24 Alpha Spot HPE 700s for decorative gobos and architectural lighting; 24 Alpha Wash 700s for the musicians stage; 36 A.leda Wash K5s on the audience access to create the depth of field necessary for the broadcast cameras; and 24 A.leda Wash K10s for lighting the main stage. Technical manager for Phantom, Sedat Gündüz, comments: "As one of the Turkey’s leading suppliers of event and entertainment technology we are proud to be able to supply such a huge amount of Clay Paky fixtures for such a prestigious event. Our long-term relationship with Clay Paky has enabled us to invest in Alpha Spot HPE 1500s and Sharpys. The excellent optics, long throw, outstanding colour, and smooth washes of the Alpha 1500 range ensured we could deliver some fascinating looks for the event. The Sharpys, which were rigged on Xenon Sky Trackers, very fast speed and solid beam gave us the background contrast we needed for video and broadcast. In terms of reliability, we didn’t have to replace one fixture during the 20 days of set-up, programming and rehearsals. This was an amazing performance in 40 degree heat in Mersin." Gündüz confirms that due to Phantom’s success with Clay Paky, the company is investing in a huge amount of Clay Paky luminaires to satisfy forthcoming contracts, including an additional 110 Sharpys, 80 Alpha Spot HPE 1500s, and 80 Alpha Wash 1500s. The purchases will make Phantom the biggest supplier of Clay Paky in the region. Alberico D’Amato, Clay Paky’s Sales Manager for the region, comments: "It’s great to see yet another high profile international event take full advantage of the power and precision of the Clay Paky range of fixtures. From the compact and high output Sharpys to the long throw Alpha range and the brilliant colour wash capability of the new Aleda range, Clay Paky’s powerful precise optics means that every product in our range has something to satisfy any lighting requirement. It’s also fantastic to see Phantom grow to become one of the largest stockist of Clay Paky fixtures in Turkey. I have always been impressed by the high level of expertise and service the company offers its clients and Phantom’s success is surely a testament to this." Alberico D'Amato also notes that "the Turkish market is constantly growing, there are many really important activities in all areas of professional entertainment and a strong demand for high quality technologies." Clay Paky products have been specified for years in the most prestigious live events in Turkey, in the main TV studios (TRT, KANAL D) and in the most prestigious venues, such as the Billionaire in Istanbul. "Thanks also to the valuable and qualified work carried out by SF Ses ve Isik Sistemleri aS, exclusive Turkish distributor for Clay Paky, with all my gratitude for the wonderful work he has done over the years," says Alberico D'Amato. Samim Mutler, president of SF, adds: "We are proud to distribute Clay Paky for over 20 years. I believe our partnership is one of the "old" and firm ones within the Clay Paky sales network. The secret of our success lies in the widespread presence throughout Turkey, in the mutual collaboration with Clay Paky over the years and in our personal loyalty to this brand of global prestige." The 2013 Mediterranean games saw record participation of 6,000 athletes from 24 countries and entertained spectators totalling 25,000. Istanbul is bidding against Madrid and Tokyo to host the 2020 Olympic and Paralympic Summer Games. The International Olympic Committee will announce the Host City at the 125th IOC Session in Buenos Aires this September.